Highly intelligent and social birds. As pets, Quakers are capable of developing a vocabulary consisting of a variety of words and phrases. Domesticated Quakers have the ability to identify various objects in the English language beyond basic mimicry. Generally found to be extremely intelligent, comical, and engaging birds. 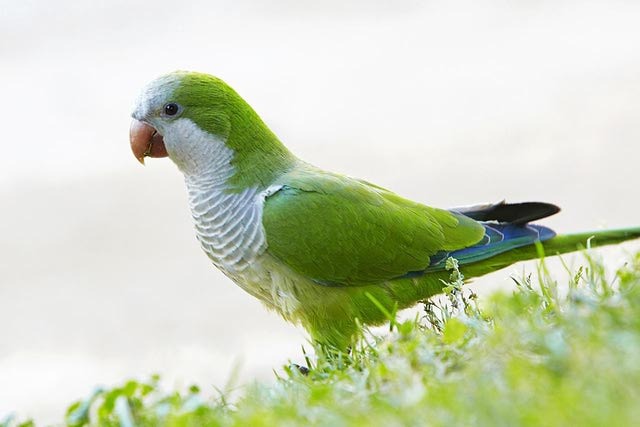 Considered one of the best talkers among smaller parrots. Quakers have the ability to develop a variety of words and phrases in the English language from an early age through the act of mimicry. Its ability to speak from an early age has it gaining popularity as a global favourite bird to teach to talk. Quakers can be found conversing or practicing their vocabulary independently. Feather plucking in Quaker’s can be due to a endocrine or live disease, food allergies, poor stimulation and other various allergies. Furthermore its is important to try identify whether your bird suffers from Quaker Mutilation Syndrome, whereby your bird will do more than just pluck, and will begin to mutilate the flesh on its chest, wing webs, and thighs. Quaker’s need a clean, warm, mentally stimulating environment. A wrought-iron parrot cage, free of rust and chips is the best home for a pet quaker parrot. As a rule the cage size for your Quaker should be 24” x 30” x 24”. The bar spacing is very important, and should be at least 1/2” to 5/8”. Keep the cage as far from any noisy or busy areas. Placing your Quaker in a family centered room so they feel a part of the flock. Locate it out of direct sunlight and draughts. At least three different types of toys should be available to your bird in his cage at one time. A variety of swings, foraging toys, and plastic puzzle toys are perfect for their mental stimulation. Allow them out of their cage on a daily basis. Allow them to explore by investing in a gym or T-stand. Feed your Quaker a good quality pellet and seed diet. Incorporate a mix of fresh fruits and vegetables into their diet on a daily basis. Remove any uneaten fresh food after 24 hours. 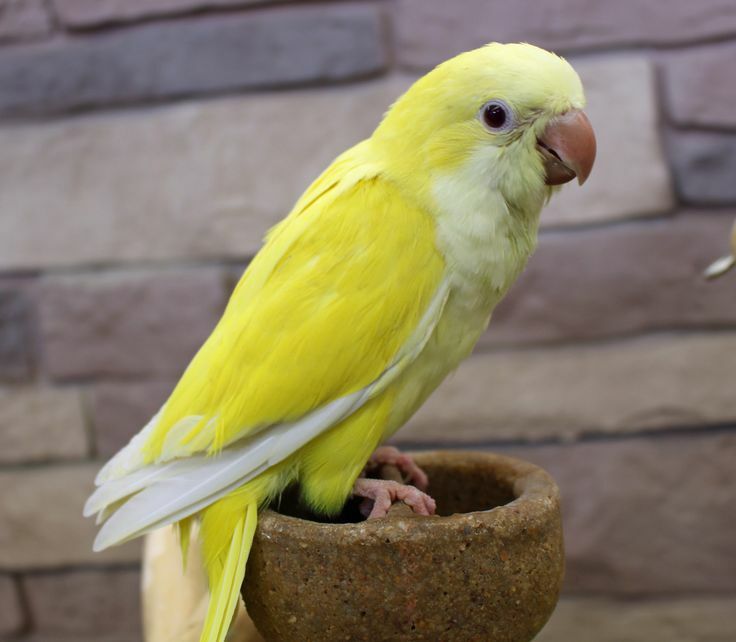 The only necessary supplement required for a correctly fed parrot is calcium. Introduce calcium into their diets with the use of a cuttlebone or calcium treat. Make sure your Quaker is getting a good amount of vitamin A, which can be found in the form of red and orange fruits and vegetables. 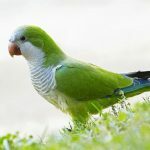 The Monk Parrot has established non-indigenous populations across the United States. 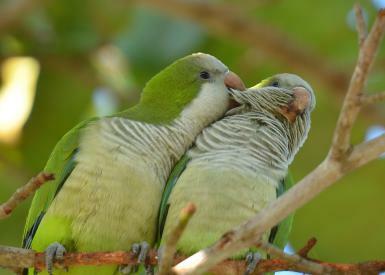 Furthermore they are known by several different names such as Quaker parakeets, Monk parrots and Monk parakeets. 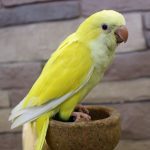 As a result of selective breeding, Quaker parrots are now available to pet owners in a variety of beautiful colour mutations. They are all variants of the same species – Myiopsitta. 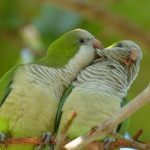 When correctly cared for, Quaker parrots can live past the age of 30 years. For this reason they are not recommended for beginner bird owners, as they are highly social and tend to form a strong bond with their owners. Known for their high degree of intelligence, Quakers are excellent speakers. They have the ability to learn a diverse vocabulary of words and sounds. Furthermore, they are able to speak with immense clarity compared to other parrots. I have a blue 5 year old Quaker which is a pre-loved bird. I love him dearly but I can’t touch him with my hands. He will sit with me & he will preen me & follows me around. I haven’t had his wings clipped. His diet is awful. I give him fruit & veg (cooked & raw) but he won’t eat anything except peas. I’ve had him 3 years. Has anyone got any ideas as to his lack of a good diet? I can certainly help you with introducing a new diet to your little one. I totally agree that eating one Veg only is not enough and the diet should be more varied to provide the required nutritional value. Please get in touch on 0800 327 7511. I have a Quaker parrot he is such a character he’s built a nest in a basket and robs my kitchen of anything that’s shiny sometimes I think he might be a magpie. He whips my spoon out of my cup of tea for his nest he doesn’t say too much but he does so many intelligent things I actually don’t need him to talk! I love him so much he is Harley he bites me when I try to take my things back so I wait for him to go to bed to take back my stuff! Thank you for sharing yours and Harleys story. Quakers are super intelligent and wonderful pets. Maybe we can see a picture of him?